Photo from Sleepy Eye FFA The Sleepy Eye FFA Proficiency applicants for 2017 included: (Front l-r): Cassidy Hoffmann, Harley Braun, Josie Lang, Parker Neid, Isaac Nelson, McKenzie Cselovszki, Cassidy Hacker, and Isabella Portner. Photos from Sleepy Eye FFA The Sleepy Eye FFA Chapter had 15 State FFA Degree candidates for 2017. (Front l-r): Anna Landkammer, McKayla Aschenbrenner, Melissa Kral, Cheyenne Gardness, Allison Helget, Natalie Sellner, Sarah Rossbach, Isabella Portner, Johnny Rosenhammer, Lane Trebesch, Adam Steffl, Colten Gemmill, and Hunter Rose. Not pictured: Zoe Macklanburg, Tyrah Stoll. On Thursday, Feb. 9, Sleepy Eye FFA had members interviews for State FFA Degrees and Proficiencies in Westbrook. 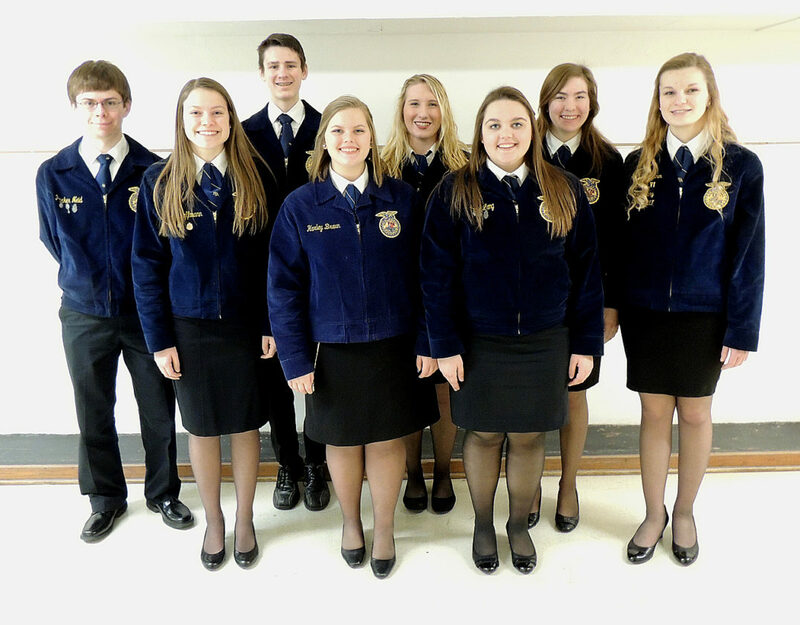 Thirteen members applied for State FFA Degrees, the second highest degree achievable in FFA, and many members applied for different agricultural Proficiency Awards. In order to receive a State FFA Degree, the following qualifications must be met. Having a Chapter FFA Degree, being an active FFA member, completing at least 2 years of agricultural classroom instruction, having earned and invested at least $2,000 or worked 300 hours through an SAE, as well as completing at least 25 hours of community service. 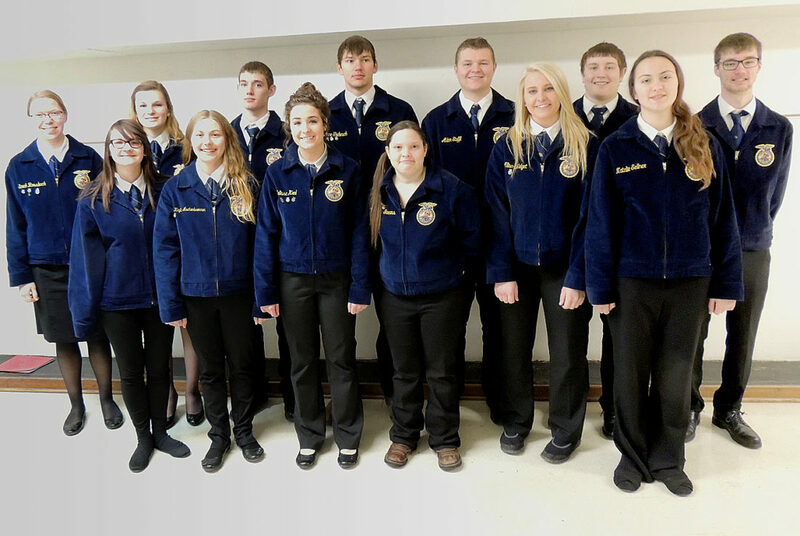 The members who applied for the State FFA Degree included: McKayla Aschenbrenner, Cheyenne Garness, Colton Gemmill, Melissa Kral, Anna Landkammer, Zoe Macklanburg, Sarah Rossbach, Adam Steffl, Hunter Rose, Tyrah Stoll, Lane Trebesch, Allison Helget, Isabella Portner, Johnny Rosenhammer, and Natalie Sellner. Qualified members will receive their State FFA Degree during the Minnesota State FFA Convention, which will be held in April. Sleepy Eye had proficiency applications as well at the Region VI Review. The third competition of the day was for the Region Star Awards. The Region Star represents the best of the best among region State FFA Degree recipients. Finalists for this award have mastered skills in production, finance, management and/or research. This year’s candidates from the Sleepy Eye FFA Chapter were Hunter Rose- Star in Agribusiness, Isabella Portner- Star Farmer, and McKayla Aschenbrenner- Star in Production Placement. Hunter Rose was selected as the Region VI Star in Agribusiness and will be interviewed by the State Star Selection Committee in late March. The winner of the State competition will be announced at the State FFA Convention in April at the University of Minnesota. Region VI Officer Interviews were also held the same day. Josie Lang was named the Region VI Reporter for the 2017-2018 year. Josie interviewed against other region officer candidates, including Mckenzie Cselovszki, for the coveted leadership positions. Currently Josie is the Sleepy Eye FFA Chapter Reporter. Becoming a Region Officer helps FFA Members to be more active in the FFA beyond the chapter level. Serving on an elite team of FFA Members simulates working with others in a professional work environment. FFA helps teach specialized skills in hundreds of agriculture career areas. Opportunities such as this can add up to big life achievements! Lauren Klein and Karlie Ries served as the Sleepy Eye FFA Chapter voting delegates for the Region Officer Interviews. They heard from all candidates, nominated candidates for office, and voted on the 2017-18 Region VI Officer Slate.